There are several different “pet-safe” products on the market, but how do you know for sure that they are safe for your pets? One such group of products that we will be taking a look at are the different kinds of ice melts available. Many people experience snow and ice this time of year, and ice melt is a must-have. It keeps our sidewalks and walkways clear and free of ice so we can get around safely. Perhaps you saw pet-safe ice melts at the store and grabbed it to keep your furry friends safe. 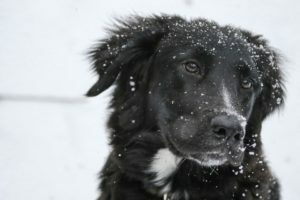 The bottom line is that some ice melt products are more pet-friendly than others, but there is not one brand that is entirely safe. The most common kinds of ice melts can be divided into two categories: chlorides and glycols. Chlorides are the cheapest for companies to make, so they are very common. The most common chloride is sodium chloride ice melt, which is common rock salt. Other chlorides include magnesium chloride, calcium chloride, and potassium chloride, which are other types of salt. Companies mine these minerals and then package them in the small pieces you are used to seeing. While there is a variety of the different kinds of chloride ice melts, there are only two kinds of glycol ice melts. They are also very different from each other. Ethylene glycol ice melt has the same active ingredient as antifreeze, making it quite dangerous if you are looking for pet-safe ice melts. The other kind is propylene glycol, which is the least effective of all the kinds of ice melt. Now that you know about the different kinds of ice melt, we will go over how each kind affects your pet. There are two different issues that come from a pet’s exposure to ice melts: topical and gastrointestinal irritation. Extended exposure to each kind of ice melt, including pet-safe ice melts, can result in topical irritation. After spending time outside, pets can lodge a piece of the substance in their feet, and the moisture mixes with it to create a hot environment. That heat between their toes or pads can irritate the skin and the more dangerous kinds (calcium salts) can even cause chemical burns. The other issue, gastrointestinal irritation, come from the pet eating the ice melt. Most types of ice melt will cause enough irritation to cause diarrhea and vomiting, but it depends on how much your pet consumes. If your pet consumes sodium chloride ice melt, it can spike their salt levels and potentially cause death. If this happens, your pet will need to visit a vet and receive an IV. The safest of all the pet-safe ice melts is propylene glycol. This is not as effective as the other kinds when it comes to melting ice, but it is more effective when it comes to keeping your pets safe. It is most safe for dogs, but it can damage a cat’s red blood cells if ingested. You will also want to keep this kind away from goats and cows because the active ingredient, urea, can cause serious health problems. If there is no such thing as pet-safe ice melts, what can we do to keep our pets safe? You can use the propylene glycol version at home, but you do not have any control over what your neighbors or the city workers use. The best thing you can do is to rinse off your pet’s paws after they have spent time outside. This will dislodge any stuck pieces and remove any residue. You can also try booties on your pets, but those take some time to get used to and some pets will only try to take them off. Be sure to monitor your pets for any unusual behavior, then talk to a vet if you notice something.